A lively discussion / debate took place on Retailwire.com about whether retailers were using chargebacks as justifiable penalties for poor performance by vendors or an unjustified means of generating income for the retailers. The fact is that fees, discounts and chargebacks are becoming more common, and in private conversations – when no retail customer is within earshot – vendors will verify this. Retailers say that such chargebacks are only compensation for vendors not complying with processes that have been clearly laid down and agreed to, since non-compliance creates extra costs for the retailer, or loses the retailer margin. But is vendor performance really becoming worse with each passing season? Or is it that difficult trading conditions or insufficient skills are making buyers take this easy road to margin? It’s an open secret that merchandise quality and delays - the two most common causes for chargebacks - are easily overlooked when the market is hot and the product is in demand. Chargebacks are a dangerous tool in the hands of a lazy, short-term thinking buyer who is incentivised on gross/realised margins from season to season; to him/her they are a quicker way to get to that bonus check for the season. Pragmatic vendors, for the most part, don’t want to antagonise the buyer because that risks not just business with the current retail customer, but any retailer that the buyer moves to in the future. The Retailwire discussion on this topic (with comments justifying both sides) is here - ”Clothing Vendors Take a Chargeback Hit” – and the original article in Crain’s New York Business is here - ”Retailer fee frenzy hits designers“. In his latest book, Professor Richard A. D’Aveni focusses on a topic that most businesses should be acutely concerned with: the problem of commoditization. In interviews he has accurately described commoditization as “the black plague on modern corporations” and “a deadly disease that’s spreading like crazy”. Certainly, if one had to pick the ultimate nightmares to keep CEOs awake at night, commoditization would definitely be among the top of the list. Specifically, given the economic uncertainties around the world in the last couple of years, business leaders who are not concerned about their products or services being turned into commodities are either supremely equipped to maintain their differentiation, or immensely deluded as to their capabilities to fight market forces. Prof. D’Aveni suggests that maintaining differentiation alone is not enough to sustain business. Deterioration: In a deteriorating market, competitors present low-cost and low-benefit offerings that appeal to the mass market. This is possibly commoditization in its “purest” sense, where the customer ends up valuing the lowest price over and above any other benefit or feature. In this scenario a business can either get stuck in the commodity trap, fighting an ever downward spiral of price and cost minimisation, or could marginalize itself to a niche where it can protect its margins. Proliferation: According to Professor D’Aveni, a proliferating market constantly sees the emergence of new combinations of benefits and price that serve specific segments. This is not about the business offering turning into a true commodity, but extreme differentiation and proliferation of choice do make it difficult for businesses to create a clear value statement that can be priced above competition. Professor D’Aveni describes this as “being squeezed in the middle of a pack of piranhas” which are snapping away pieces of the market. Escalation: This form of commoditization is possibly the most prevalent in industries that are prone to disruptive changes (such as technology, consumer electronics and communications). Simply put, extreme competition here results in more for less, as each competitor goes one-up in terms of offering more benefits for the same price, the same benefits for a lower price, or at its most extreme, higher benefits for a lower price. Prof. D’Aveni suggests that companies try and control this downward momentum. 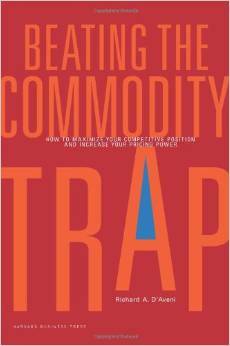 The book suggests competitive strategies that a business could take to avoid getting caught in the commodity trap. These strategies can be boiled down to the biological choice: fight or flight (escape). Professor D’Aveni echoes the basic warfare strategy laid out by many military and business strategists through the ages. He suggests that businesses need to gauge the opponents, choose their battles, and pick opponents against whom they can win. He also calls for pre-emptive action: where companies can, they should either change the business environment to avoid commodity battles entirely, or initiate the battle of commoditization and control its direction and momentum. In fact, anticipation and pre-emption is the key to avoiding the commodity trap. To help with this, Prof. D’Aveni offers a relatively simple framework to analyse a current market situation in terms of a price-benefit matrix, and to identify the advance corrective actions to be taken. The book is short and straight-forward enough to pick through a domestic flight, or to read in the back-seat during a long commute between office and home. The easy to understand framework gets the messages across quickly. In analysing the variations of commoditization, both in consumer and business oriented industries, the Professor also offers up something for everyone. However, the book’s strengths also turn out to be among its biggest weaknesses. The book would have benefited from more depth to each of the concepts. Skipping quickly from one area to the other, in some places the book risks losing coherence of thought. Some short books are like downhill hairpin bends on a mountain road; Prof. D’Aveni’s book is one of those. Much as you might be tempted to go fast, it’s advisable to go slow. If you speed through it, you might miss a nugget that actually makes sense to your business. One of the other grouses I had was with the examples quoted. The predominantly US market examples reduce the book’s relevance for a global audience – the Professor presumes the reader will know the company and its context well enough to understand the lessons being discussed. In some cases the examples are incomplete and possibly even incorrect: one such is the example of Zara. The broad-brush attributes Zara’s business success to turning fashion into commodity, and ignores the fact that fashionability and desirability are a cornerstone of Zara’s offer, not the cheapest price. Others would possibly be far more accurate examples of commoditization in the context of price.